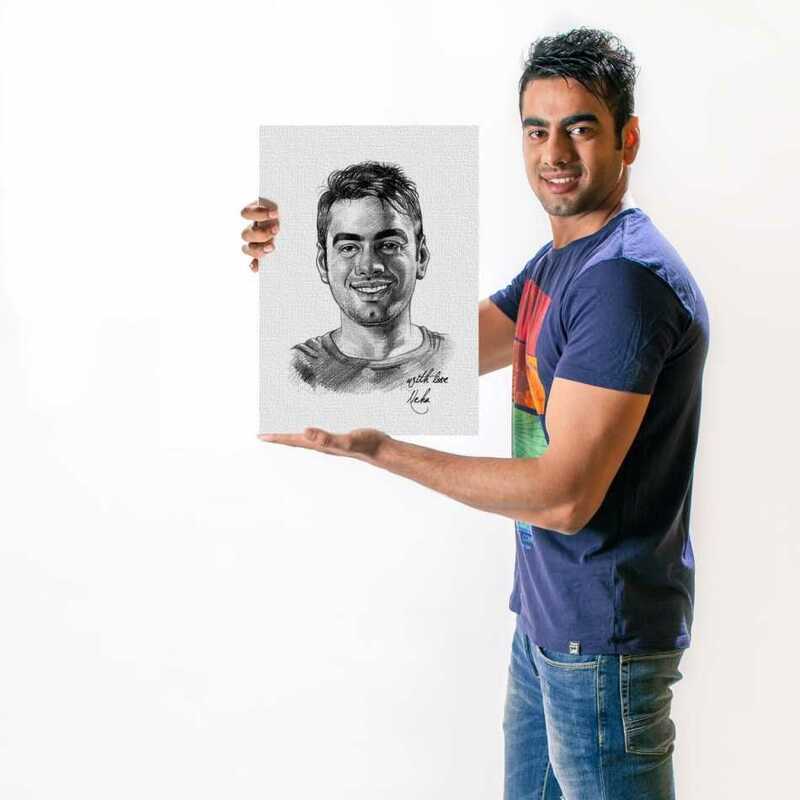 Let talented sketch artist, draw an amazing sketch of the person you want. You need to send good quality photo of the person, and our artist will draw pencil sketch based on that. The artwork will be printed on canvas and mounted on A3 sized frame. It will be a perfect gift for him. Name / message on the artwork ? The sketches are hand drawn by the artist using different pencils, based on the photos provided during the order process. These pencil sketches are then converted in a digital format, and printed using the best of technology on canvas. The canvas is mounted on a wooden frame, and is fade-proof, and long lasting. A sketch is generally a rapidly executed freehand drawing that is not usually intended as a finished work. However, here our artist make it sure, that it looks just perfect and up to the mark. A sketch may serve a number of purposes: it might record something that the artist sees, it might record or develop an idea for later use or it might be used as a quick way of graphically demonstrating an image, idea or principle. And keeping a couple sketch in your living room, will add the emotions and love in the surrounding at all times. || Can I also have the digital format of the sketch if I order this product ? Yes, you can have the digital format of the pencil sketch as well, which you can later use as per your need. You can get it printed on cards, canvas, t-shirts, mugs or whatever you like. Can I get a colorful sketch, instead of the black and white one ? Sorry, but this product is meant to be a black and white pencil sketch. If you are looking for colorful ones, you can search for the ' oil paint ' couple canvas.